The wrestling world was hit with some saddening news of the passing of Dusty Rhodes. His death was unexpected and the ripple will be felt for years to come. He revitalized the art of professional wrestling and was continuing his trait through NXT. His presence was felt throughout the next generation of WWE superstars who looked to him daily for guidance and feedback. If you were any kind of a wrestling fan during the 1970s and 80s, you already know the talents and traits of the American Dream. During this time is when the legend of the Common Man was built. He was one of the biggest names in the industry and left a long lasting legacy no matter what territory he was associated with. 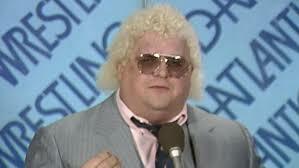 Dusty displayed his legendary status every time he stepped into a wrestling ring and each time he had a mic in his hand. The distinct sound of his heritage along with the vision of a creative genius opened up our eyes to a man whose passion would outweigh his athletic stature. He has a litany of classic matches to his credit and a list of creations that stretch miles around the globe. His legacy will live on through his two sons, Cody and Dustin, but there will never be another American Dream. The flood of heartfelt condolences have been pouring out around the world. You do not have to be a sports fan to know who The Dream is, which is a credit to his character and reputation that only he could have built. In honoring his life and career, let’s take a moment to look back at some of The American Dream’s defining moments throughout his legendary Hall of Fame life. Let’s start with one of, if not the most iconic wrestling promos in the industry’s storied history. As a master on the mic, there are dozens of interviews to choose from, but this one stands above all the others. It’s a promo that should be required viewing for any wannabe pro wrestler. It’s a creative masterpiece and is the moment that truly defined Rhodes as the blue collar hero that won him undying crowd support for decades. The promo was his answer to Starrcade 1985 and his match with the champion, Ric Flair. Dusty was a man of the people, and thirty years later the message remains relevant and this promo still resonates. Despite the fact that Vince McMahon is given the credit as the man who revolutionized the industry, it was The Dream’s vision that gave us unforgettable events like War Games, and his brilliant reputation that brought to life huge events such as Starrcade and The Great American Bash. Not to slight Vince, but for an extended period of time there was no greater mind in the business than Dusty Rhodes. Moreover, while Vince was trying to monopolize the PPV business, Dusty came up with the brilliant vision of the free Supershow know as Clash of Champions. This was one of WCW’s premier events that not only created a newfound buzz about the company, but gave an infinite amount of defining moments that will last a lifetime. Is there any battle in wrestling more memorable than the Four Horsemen and Dusty Rhodes? This was an ongoing battle that was the focal point of the NWA (and, eventually, its cable-friendly successor, WCW) and achieved legendary status due to the amount of high class personalities it took to keep the storyline flowing. The feud consumed the airwaves for some time, but always left us in suspense. This is the same kind of suspense that is greatly missed in the WWE today. The rivalry got kicked into high gear after an incident in Charlotte, NC, when Dusty Rhodes attempted to aid Ric Flair in the August of 1985. Flair had just defended his World Title in a steel cage against the Soviet Union’s greatest export, “The Russian Nightmare” Nikita Koloff. Koloff’s Uncle Ivan and fellow Russian, Krusher Kruschev were beating on Flair, when out of nowhere, Dusty Rhodes comes down to the clear the cage of the evil Soviet attackers and save Flair from more punishment. Suddenly, Ole & Arn Anderson come into the cage and proceed to attack Dusty in the middle of the ring. The attack ended up breaking the ankle of Dusty Rhodes and led to the special boot that will go down as a piece of wrestling history. This incident led to the main even match at Starrcade ’85, for the NWA World Heavyweight Title pitting Dusty Rhodes versus “The Nature Boy” Ric Flair. In 1986 the Four Horsemen and Dusty Rhodes were involved in a segment that cemented a legacy of confrontation that still lives on today. The segment that happened to be filmed in a parking lot was an old school attack and left the fans feeling the pain of Dusty’s broken arm. Remember, this was a time where a big percentage of the sport was thought to be unscripted and the fans wore their emotions on their sleeve. All of us wrestling fans can probably still see the vision of the shaky camera chasing the action that seemed to be real. There were literally fans crying while the video was being aired. The Four Horsemen were vividly popular because of segments like these. But without the willingness of Dusty to be instrumental in putting them over, their quick rise to fame may have been stalled. The WWE Hall of Fame is seen nationally by some as an afterthought or an unnecessary occasion. After all Vince McMahon may have welcomed this opinion by coming out and fueling the Wrestling is Sports Entertainment message. Was there ever a greater feud in wrestling? The abundant amount of rivalries throughout the years can compile a mile long list, but the way in which they formulated a weekly saga cannot be understated. We can all look at Austin/McMahon rivalry as the elite, but the numerous battles between these two Halls of Famers belong on its own rating scale. Dusty and Ric were so much alike in terms of character that they quite possibly could have switched places at any given time. They were so good at what they did, so convincing in their roles, that while it may be hard to imagine Dusty in a three-piece custom made suit wearing the Rolex, there is no question that he had the ability to pull it off. Fortunately for The Nature Boy, Dusty gave him some of the best advice he’d ever receive and told him “instead of trying to be the next Dusty Rhodes, focus on being the first Ric Flair.” And we all know how that turned out. Flair and Rhodes main-evented in practically every wrestling arena in America at one time or another and always managed to add something different to keep their battles fresh. They played off each other so well and were the perfect enemies to win over the interest of the wrestling world. Obviously, this is just a sample of some of the greatest rivalries, promos and matches of a true legend of wrestling. Dusty Rhodes was a creative genius in and out of the ring. He will be forever remembered and responsible for ideas that haven’t even been implemented yet. Yes, he was that good. Whether it was wearing Cowboy boots with Babydoll or Polka Dots with Sapphire, the American Dream was always a pleasure to hear. The fans of America have lost a great person and a true legend. Rest in peace Dusty. You will be forever missed by the millions of fans you entertained for decades and will never be forgotten.